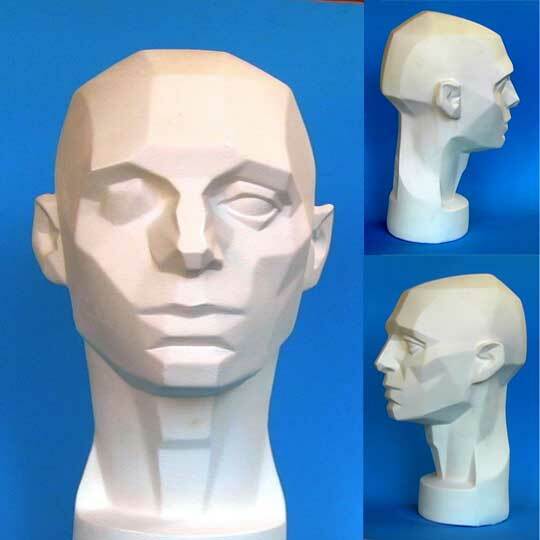 I was having a very hard time sculpting my first head a few months back. My first two ended up close, but not really good enough. I came across this model a few weeks back, and was instantly struck dumb by it’s simplicity, well, struck dumb and then regained my senses, hastily pulled out my wallet and bought one on ebay. One of the best learning aids that helped me instantly. I did not realize what I needed as a solution until I saw all the answers. Move your lamp around the head, and you’ll see how the light falls. Right off the bat, you’ll notice the left and right hemispheres are different. The left side (your left, really, as you are looking at the model) is the simpler of the two, so I suggest to start with that if you are new to sculpting. There are less planes, and whether you are sculpting or drawing, you’ll see how light falls on the face at the cheek, or brow. One of the realizations I had in reviewing my work was my misplaced cheeks… only off slightly, but enough to throw the whole thing off. I used the left side to do the main sculpts of the head, and as soon as that was done, I turned my attention into refining the face more by looking the right side. You’ll notice the cheek on the right side has many more planes to take into consideration. The first time I sculpted a head using this aide, I hit it right on the head (yup, pun intended). I was pretty impressed what it allowed me to do. Editor’s Note: Buy one directly from Planes of the Head.